Our Premium Quality Wood Pellets are suitable for use in all pellet boilers and multi fuel stoves and are of the highest quality having been accredited with the ENplus A1 standard, which guarantees the wood pellet quality and heat value. Our Quality Wood Pellets have a low moisture content, compact density and high calorific value making them an ideal biomass fuel. Our wood pellets have low emissions and a very low ash content when burned. Wood pellets are low maintenance and easy to use. They are easy to store, manageable and clean. With the launch of the Renewable Heat Incentive wood pellets are one of the fastest growing sources of domestic renewable energy o the market. Wood pellets are a natural and environmently friendly type of heating. With low Co 2 emissions means less pollution to the environment. 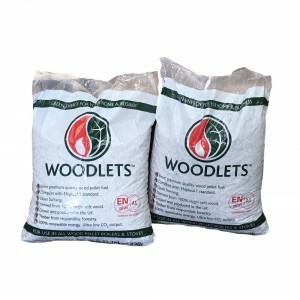 Woodlets is the UK's leading brand of super-premium grade 6mm wood pellets for use in all wood pellet boilers and stoves, they comply with the ENPlus A1 standard, are BSL registered and fully RHI compliant. Woodlets are manufactured at our UK pellet production plant situated in Girvan on the South West coast of Scotland. The raw materials that we use to make our pellets and power our in-house Combined Heat & Power unit (CHP) all come FSC or Forest Standard accredited forests in the UK. We also take in and use co-product (waste) from sawmills in the form of sawdust,woof chip and logs rejected by other industries due to their size or shape. 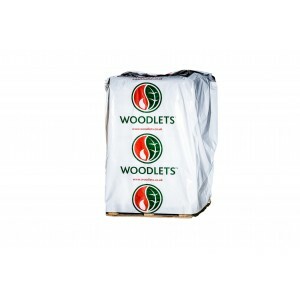 Woodlets is the Uk's leading brand of super premium grade wood pellets and the only one to off an Energy Guarantee* of 4800 KWh per tonne which works out at a cost of 5.25p/KWh* throughout most of the UK. Woodlets are BSL registered and fully RHI compliant and made from 100% UK sourced sustainable timber. 15 kg bags 6mm premium quality wood pellet fuel.BSL Certificated BSL0394551-0002Delivered from 100% virgin softwood. Clean BurningLower running costs.Grown and produced in the UK.Timber from responsible forestry.100% renewable energy. Ultra low CO2 output. 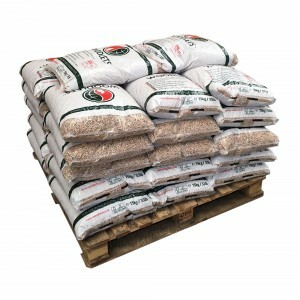 ..
32 x 15 kg bags (480 kg) 6mm premium quality wood pellet fuel. BSL Certificated BSL0394551-0002 Delivered from 100% virgin softwood. Clean Burning Lower running costs.Grown and produced in the UK.Timber from responsible forestry. 100% renewable energy. Ultra low CO2 output. ..
65 x 15 kg bags (975 kg) 6mm premium quality wood pellet fuelComplies with ENplusA1 standard Clean Burning BSL Certificated 0394551-0002 Delivered from 100% virgin soft wood . Grown and Produced in the UK Timber from responsible forestry 100% renewable energy. Ultra low CO2 output. ..